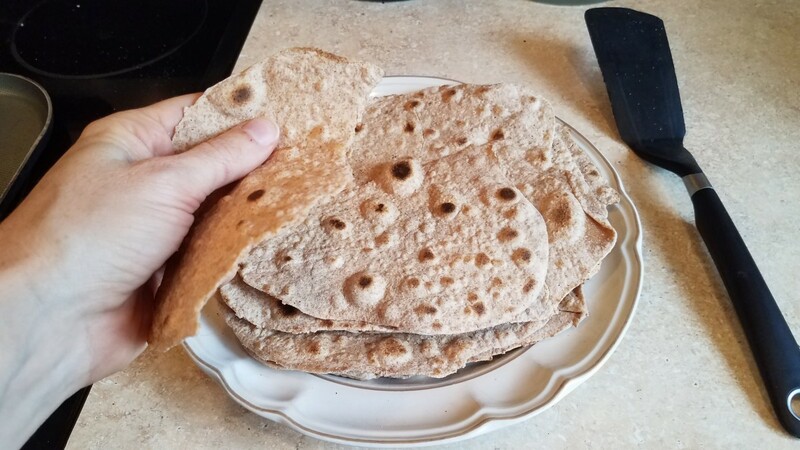 I have slowly but surely been moving to a place where I am making all of the food for our household, including bread, chips, crackers, and tortillas. 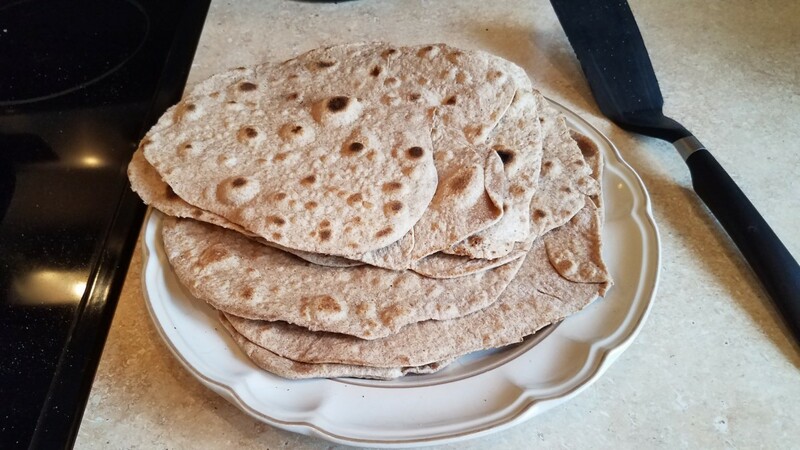 I have made tortillas many times in the past with success, but over this last year we've been purchasing some organic whole wheat ones for ease and efficiency. We must use a great deal of tortillas in this house though, because no matter how many we buy, we keep running out. Well, we've now been out of tortillas for about a week, and I discovered where all of the tortillas are going. 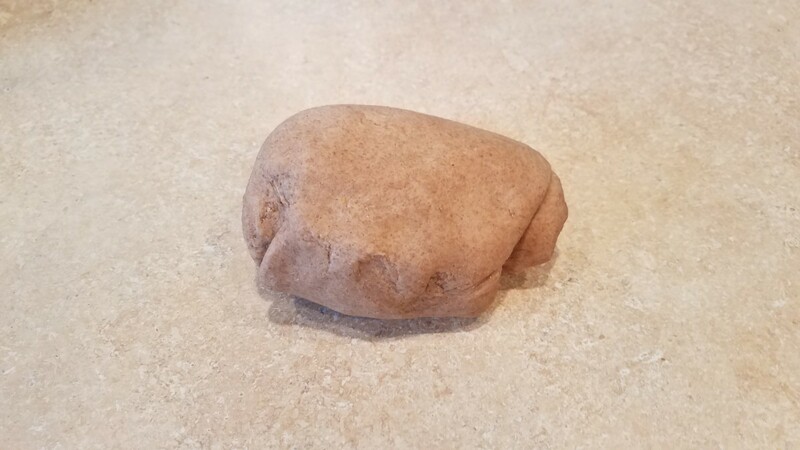 My oldest son loves tortilla cheese roll-ups and wraps. We can't make quesadillas, or chicken and dumplings, or even have tacos without them. I don't typically have a vehicle during the week as we are a one-car family, and my husband takes the car to work every day but Sunday. So if the shopping doesn't get done then, it has to wait a whole week before I have the chance again. Well, we decided to take the kids to the aquarium a good distance away this weekend even though we needed to go shopping, so here we were looking at another week without tortillas. What a fantastic time to start making them again. 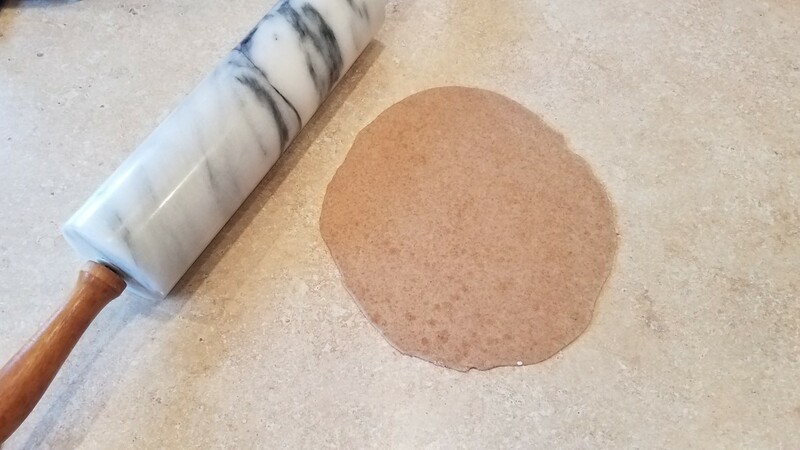 So I went back through my recipe book and pulled out my handy-dandy whole wheat tortilla recipe that I've been using for years. What I really love is that three batches of these babies came together in less than 30 minutes. Not only did we have plenty for a taco dinner for four adults that night, but we still have plenty in the freezer for when we need them. 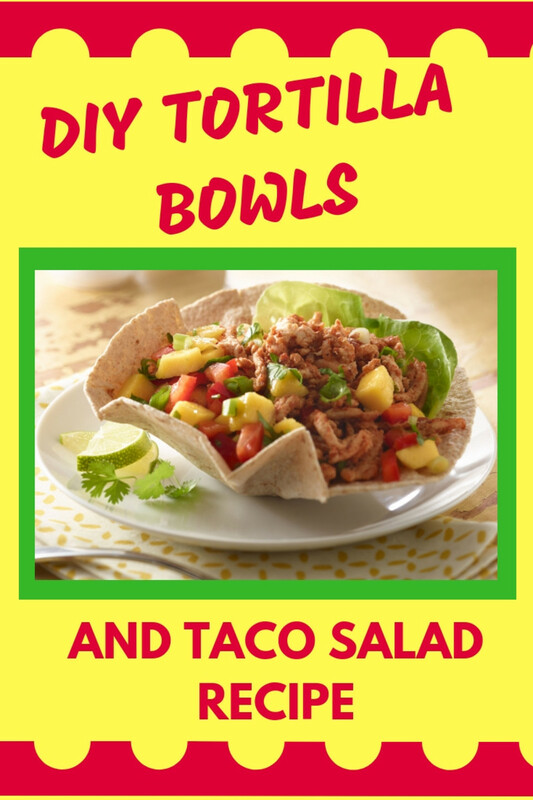 No more store-bought tortillas for us! 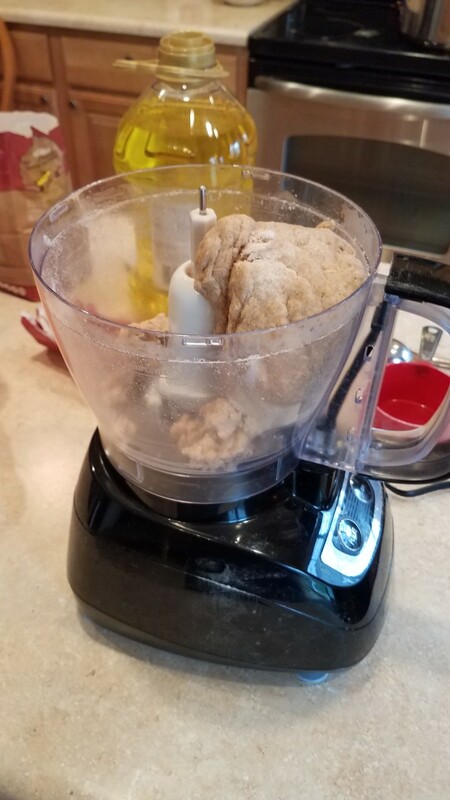 In your food processor, add your flour and salt. 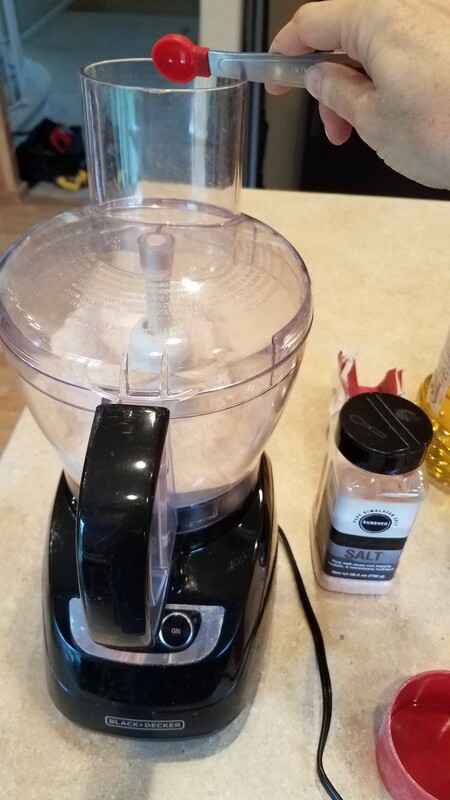 it really doesn't matter if you add the salt before you start the food processor or after. 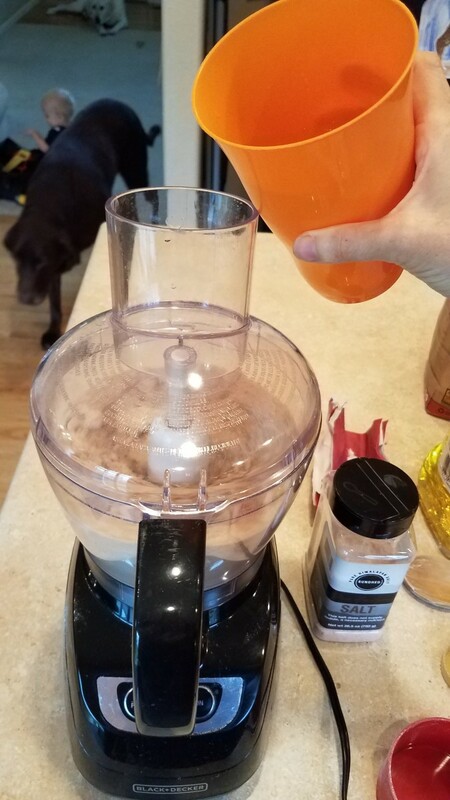 Close up the food processor and get it started. Now, one tablespoon at a time, add in your olive oil. Finally, I just fill up a cup of water and pour it in a little bit at a time until the dough starts coming together. 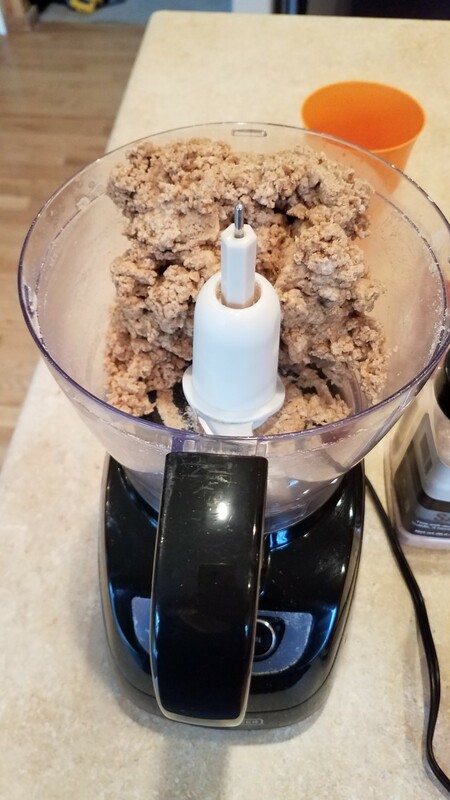 In my food processor, it clumps together and starts spinning around the middle. That when I stop and test it. If it's sticky, I close it up, start the processor again and add in a pinch or two of flour and then turn it off again. 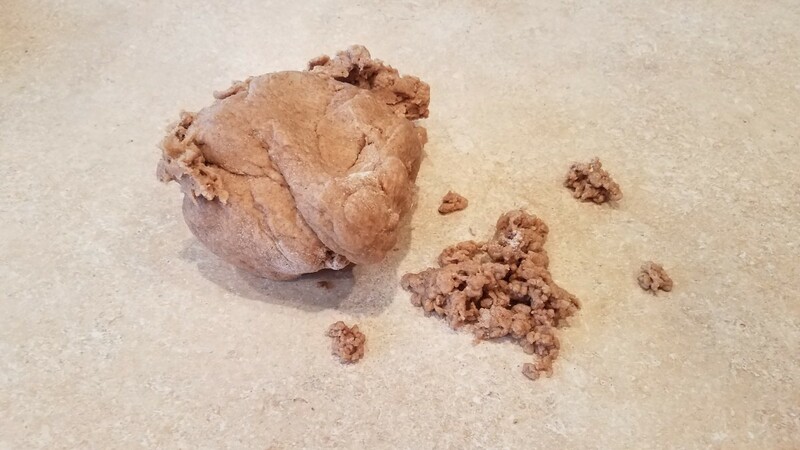 Dump it out on a clean surface and knead it for a few minutes. You want it to be soft and pliable. At this point, I set out my pan on the stove and get it heating up to medium heat. 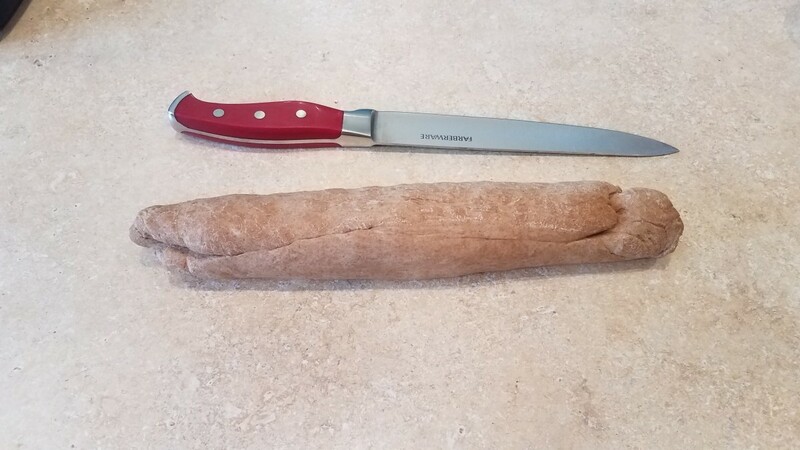 While the pan is heating, roll your dough into a log and cut it into 8 equal pieces. I start by cutting it in half, and then I cut each side in half, and then I cut cut each piece in half. 8 pieces! Roll one piece at time out on your rolling surface into a round shape. These may be hard to get into perfect circles. 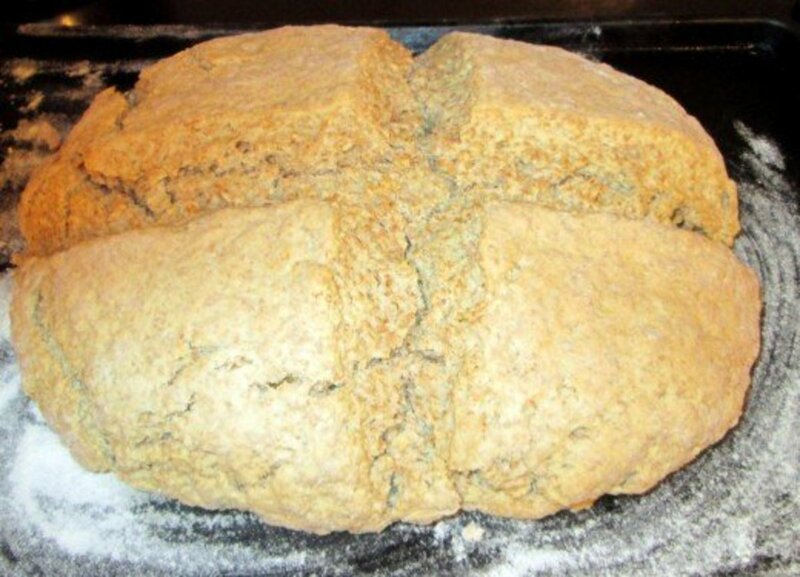 You may need a little bit of flour on each side to keep the dough from sticking to your rolling pin or the counter. But don't use too much or it will burn in the pan. Lay out your circle onto your heated pan on the stove. Cook for just a few minutes until your dough starts bubbling. Then turn over and cook for just 30 seconds longer, before removing to a plate on the side to cool. 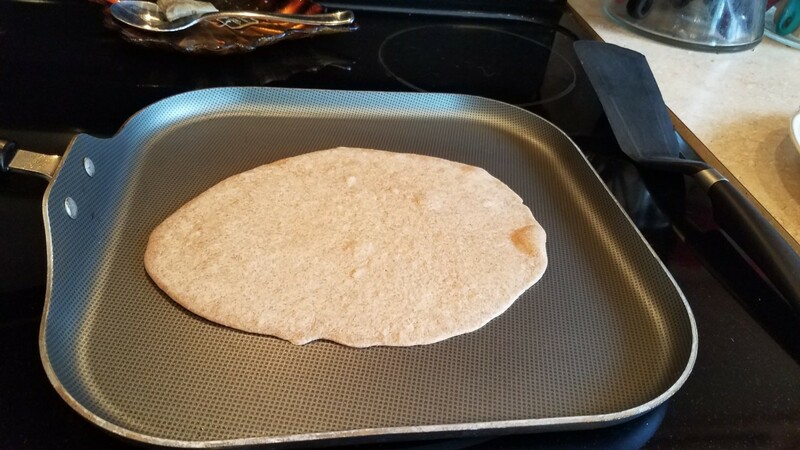 You can be rolling the next tortilla while the first is cooking. Repeat this process with all 8 tortillas. 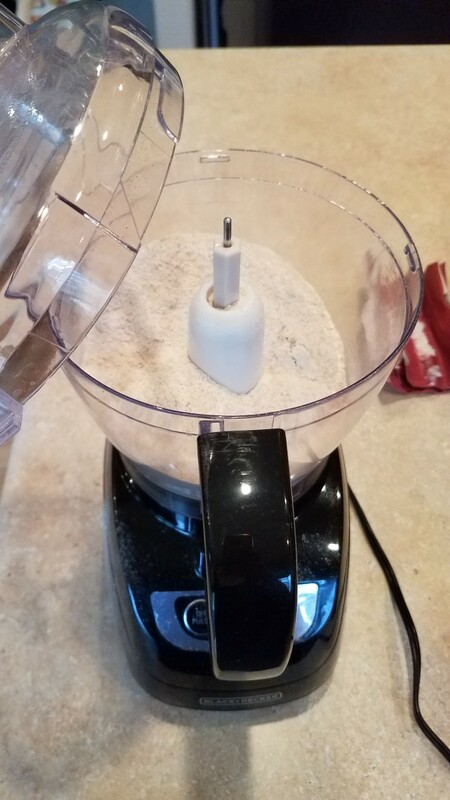 Add your flour to the bowl of the food processor. 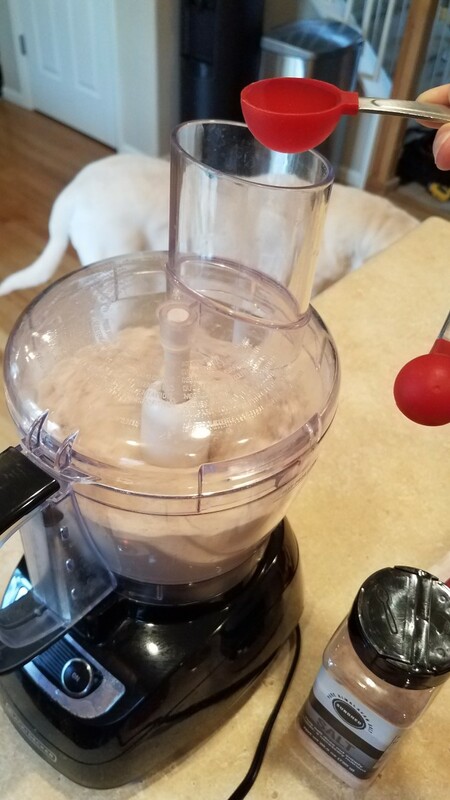 Put on cover and get the food processor started. Add your salt. Add just enough water for it to combine into a dough. 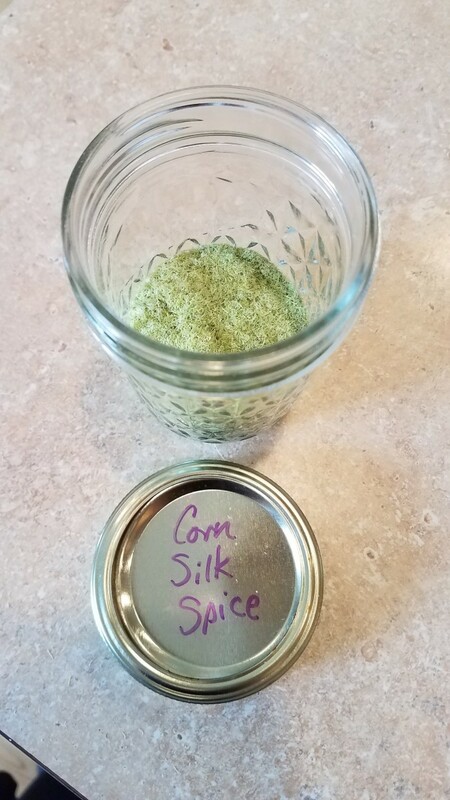 It will likely bunch together and start rolling around your food processor. If it's sticky, turn the processor back on and add a pinch of flour or so. Dump it onto a clean surface. 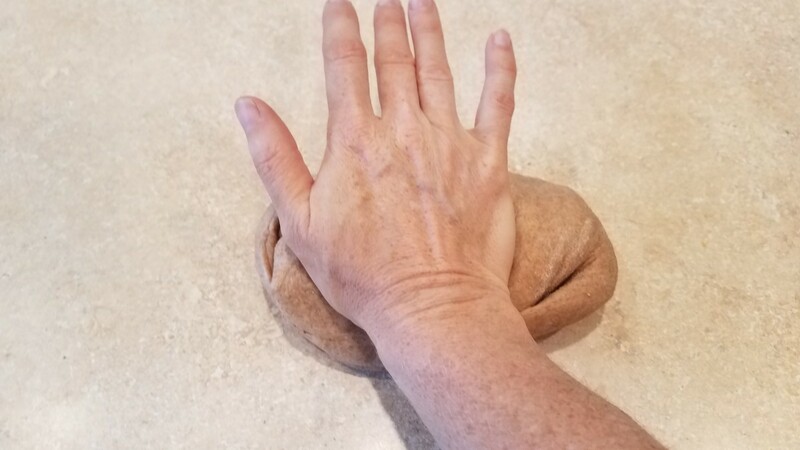 And knead for a few minutes until soft and pliable. 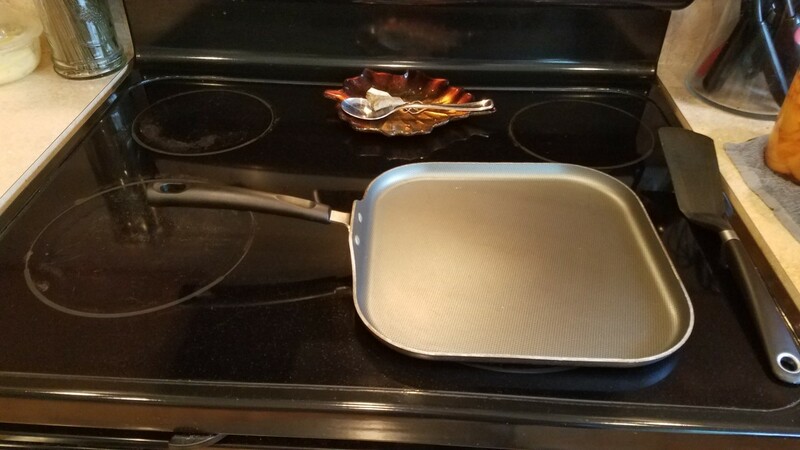 Heat your pan on the stove. 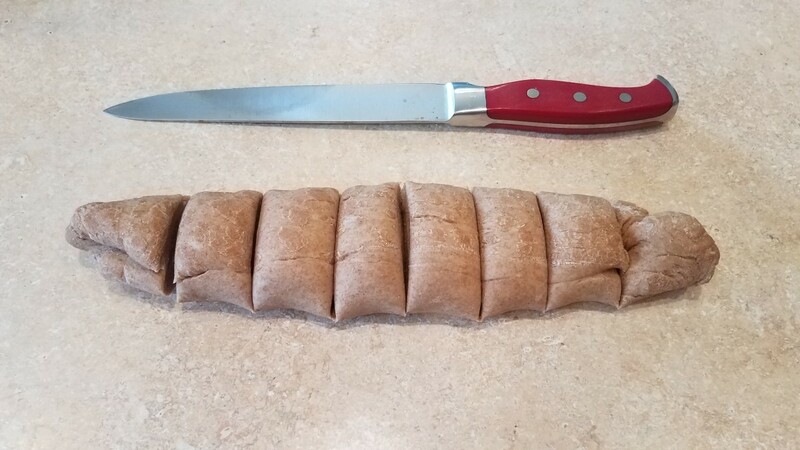 Roll your dough into a log. Cut into 8 equal portions. Roll out each one into a thin, flat circle, adding flour if necessary to keep it from sticking. Peel off the counter and transfer to your pan. Cook until you see bubbles forming. Then flip and cook for 10 seconds or so on the other side. Remove to a plate on the side to cool. 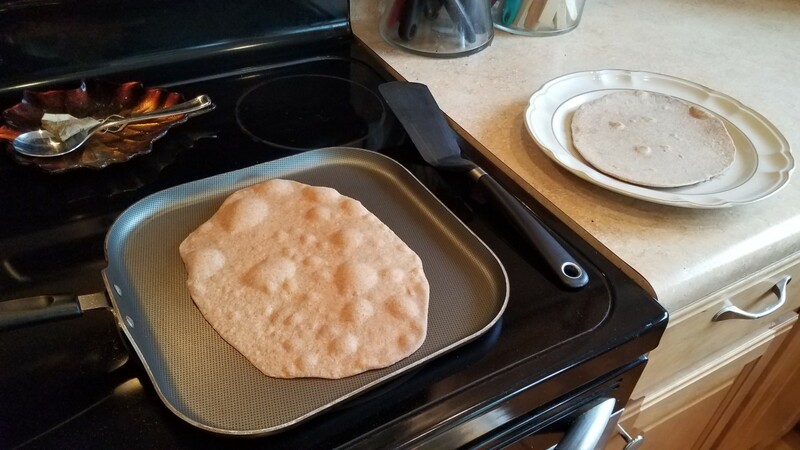 These tortillas came out perfect. They may not look completely cooked when you take them out of the pan. However, as long as they are brown on both sides, or the bubbles are, they are fine. if you cook them for too long, they will be crunchy and hard. They would make for great tostada shells, but not tortillas. They really don't need a lot of time to cook, and they came out nice and soft. 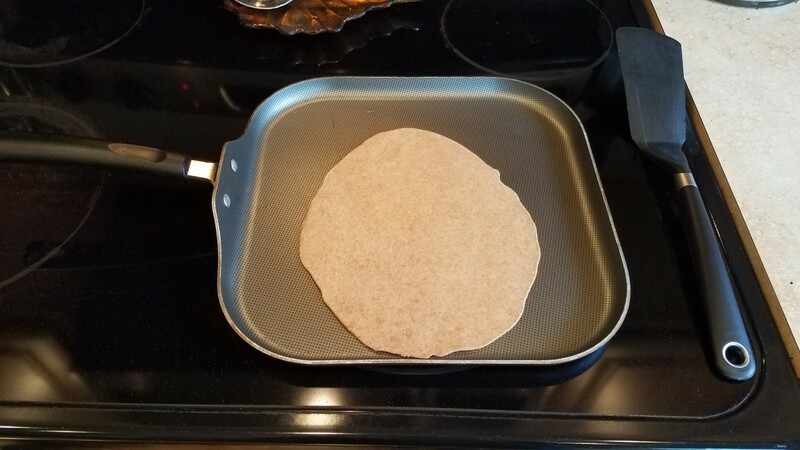 We used my freshly made tortillas for a taco dinner that night for four adults and my two kids. 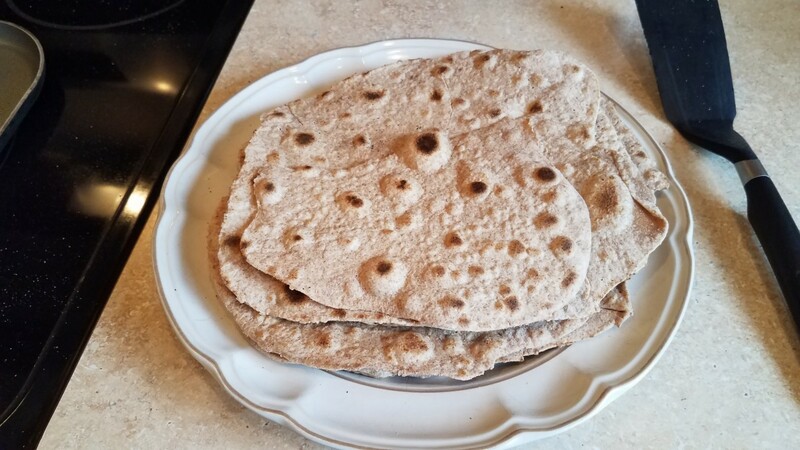 I made three batches of tortillas that morning so we still have plenty of tortillas for future meals. I bagged up each batch of tortillas individually and placed one in the refrigerator and the others in the freezer. Now when we need more tortillas, I can just go grab a bag from the freezer instead of having to worry about going to the store. I warn you though, if you store these in the freezer, you'll either have to press them flat before they start to freeze and be extra careful pulling them out, or you'll need to store them where they have plenty of room, because they will break if roughly handled. Now I can add a fun and quick tortilla making slot into my schedule along with my bread, cracker and chip making for the week or month. I really have enjoyed making all of the food for my family. 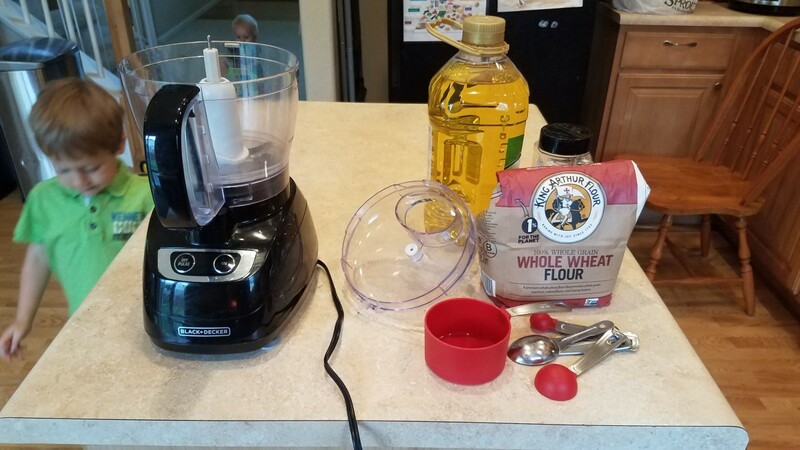 Check out how I make my own honey whole wheat bread and yummy homemade seed crackers that we really love for snacks in the afternoon. I typically make three batches of each so we have enough for a while. 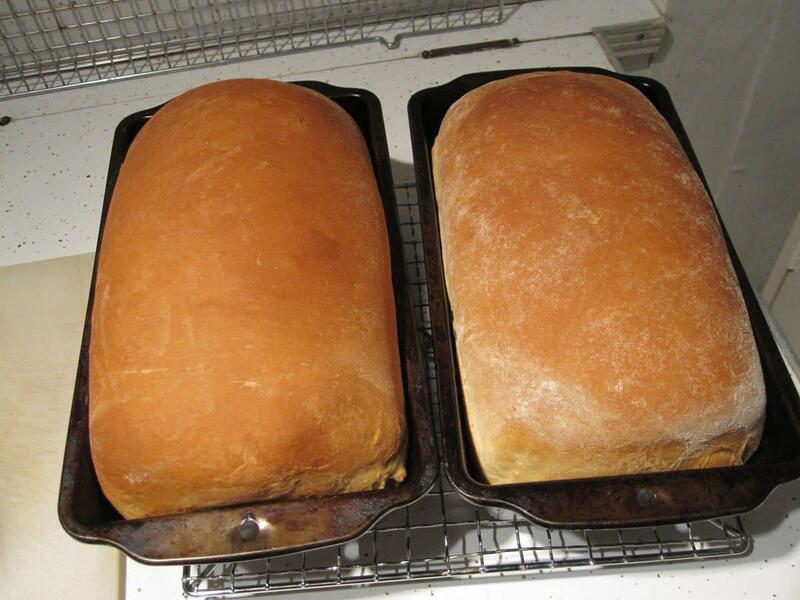 Six loaves of bread will last for a couple weeks and get stored in storage bags in the freezer while waiting to be use. Three batches of crackers will last us about a month and simply get stored in an airtight container in the pantry. So far, I haven't had to worry about them getting stale or going bad in the month it takes to eat them all. 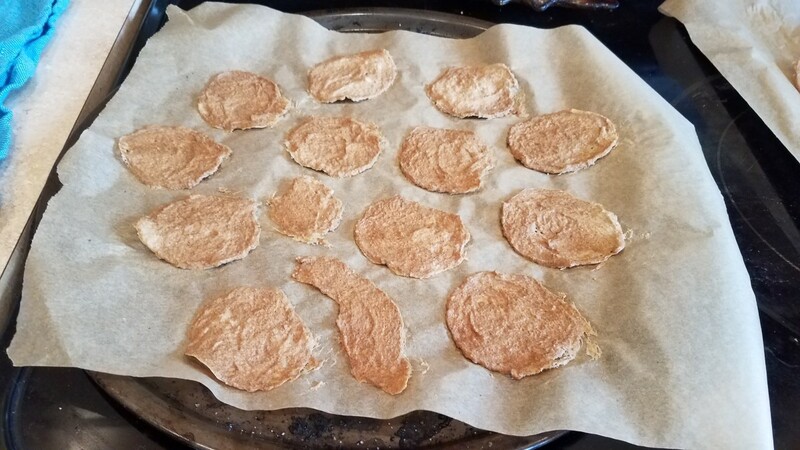 I look forward to being able to publish my chip recipe for you, as I'm getting really tired of purchasing chips by the grocery basket full, only to get half a bag each and run out of them in a week. I plan on trying some alternative grains and making some chips with quinoa, barley, millet, chia seeds, and anything else that can make a chip. I don't want them to just taste like my crackers, and it would do us all some good to get some other grains in our diet. And boy do we love chips in this house to eat with my homemade salsas and varieties of dips. 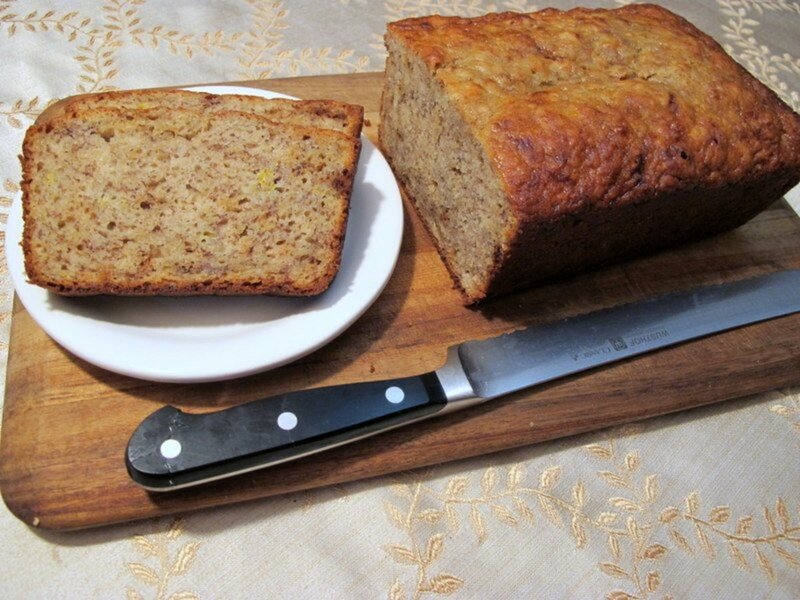 Be on the look out for some more great recipes! Pamela, thank you. We love making and eating our own food around here. My toddler seems to think I can make anything in the world and doesn't understand when we buy something we can make at home from the store, like yogurt. "Can't you make that mom?" haha I love it! It seems like you are only feeding your family some very healthy food. 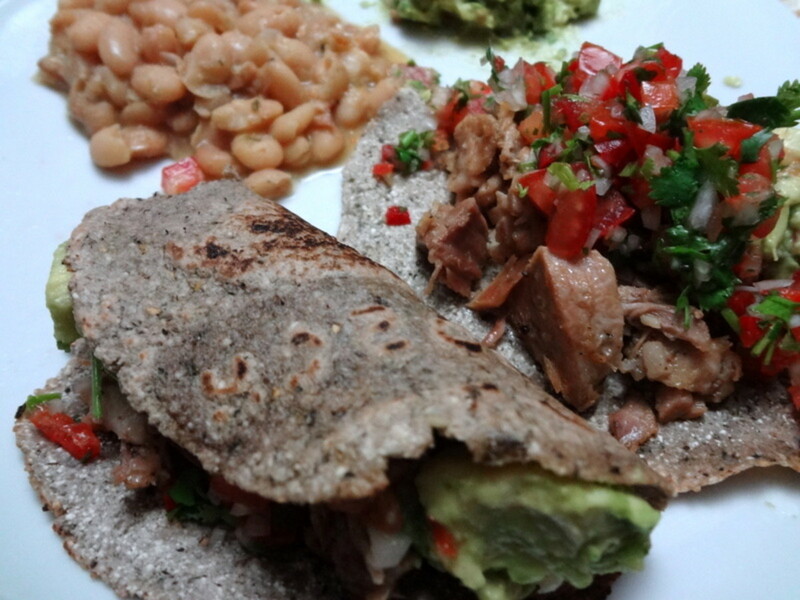 These tortillas sound very good and not difficult to make. I don't know how you do all you do either. Fantastic. Thank you. I need a whole oatmeal deal here, can you help me out? These moronic oncologists are clear that that whole oat deal is like a godsend. We are half Vietnamese so rice is right no matter. But can I do oat stuff? Me too! haha It's definitely a balance, but I shoot to post a least one or two articles everyday to both my Hubpages site and my blog. Thank goodness I love writing, cooking, and cleaning. Thank you for keeping me company. Victoria, I don't know how you do all this, write and post almost daily, and raise two young boys. I'm pooped just thinking about it!